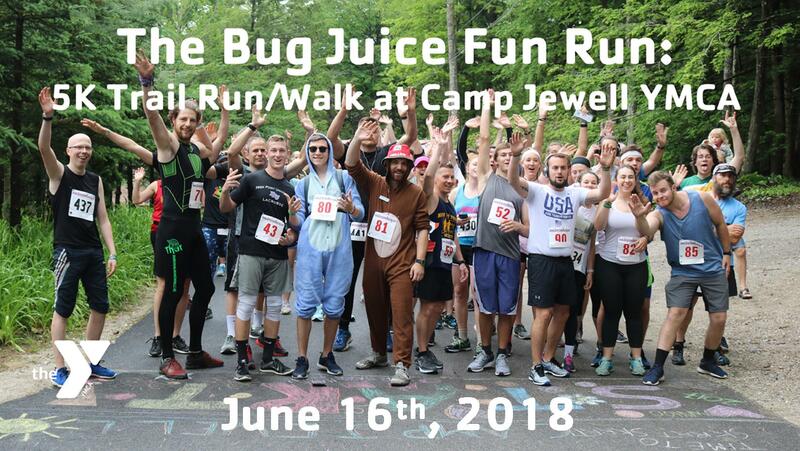 The Bug Juice Fun Run is an annual Jewell Trail Run/Walk featuring a 5K course that takes you through the scenic trails of our 540-acre site and on several winding country roads that surround camp. Child Watch will be available during the race. Our outstanding Camp Jewell summer counseling staff will host a variety of camp activities open to participants and their families after the race. Post-race fun starts with an obstacle course for young folks followed by a variety of activities such as canoeing and kayaking, our climbing tower, horse-drawn hay rides and archery. Registration begins at 8:00 a.m. and the race kicks off at 9 a.m. Activities are available until 1pm. A buffet lunch will also be available in our Dining Hall for $5 a person. Families sending campers to Summer Camp in 2018 will have an opportunity to meet and interact with the summer camp staff! Use this as an opportunity for first time campers to get acquainted with Camp Jewell! Best dressed team wins a prize!!! Proceeds from the Jewell 5K Trail Run/Walk go directly to Camp Jewell YMCA’s Annual Campaign. The annual campaign enables hundreds of kids, who would otherwise never have the opportunity, to experience the joys of summer camp. T-shirts: Free for the first 100 runners registered by June 1st. Additional t-shirts may be available for purchase on race day. Quantity and sizes are limited. Please use one registration form per participant.